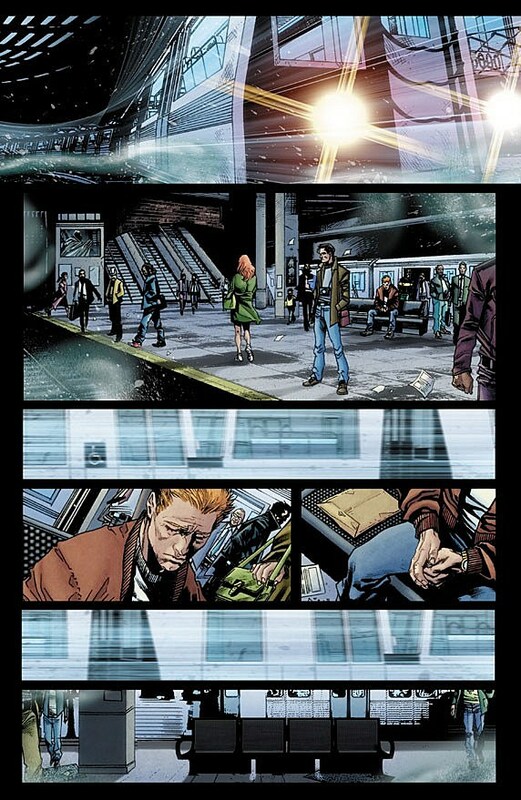 The writer (or co-writer) of such lauded DC Comics superhero titles as Batwoman: Elegy, 52 and Wonder Woman, Greg Rucka unceremoniously left the publisher in 2010 to concentrate on his creator-owned material (like excellent Stumptown). As such, that Rucka would be writing a new Punisher series for Marvel Comics was probably the most surprising announcement to come out of C2E2 in March -- but by no means an unwelcome one. 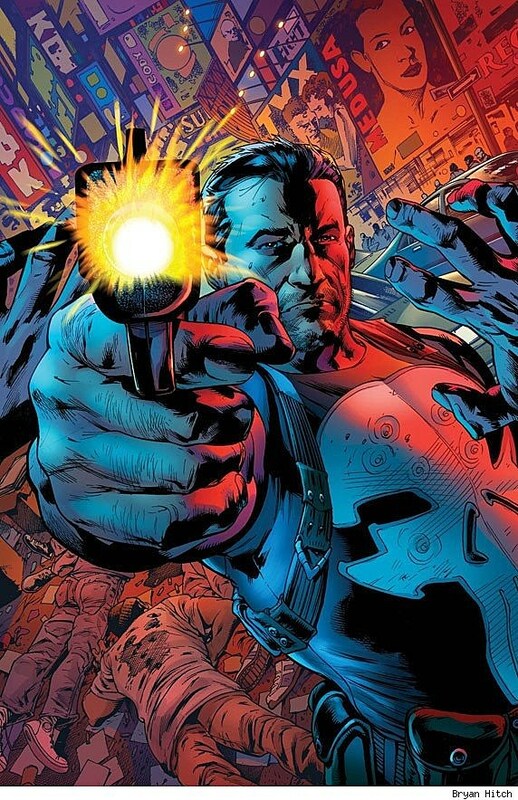 Marvel has released the first pages from Rucka's forthcoming Punisher series, illustrated by Marco Checchetto with covers by Bryan Hitch, Sal Buscema and Neal Adams. You can check them out after the jump. 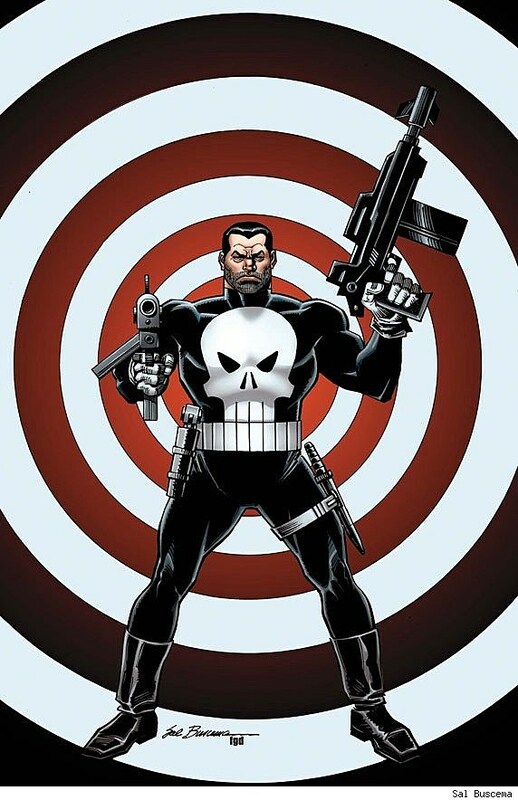 Although it's by no stretch a flagship book for Marvel, The Punisher has nevertheless been home to one of the more impressive writers rosters in the mainstream comics industry, one that's included Garth Ennis, Jason Aaron Matt Fraction and Rick Remender. 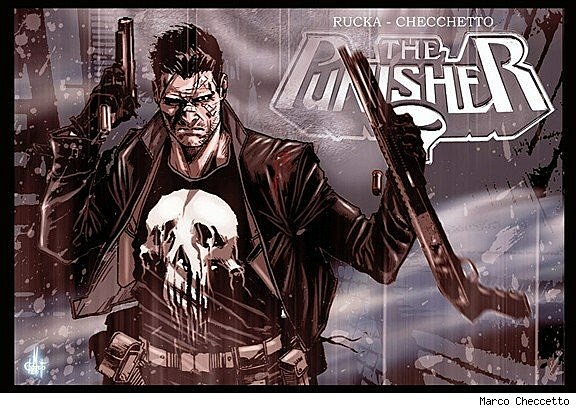 Little is known about Rucka's plans for the Punisher beyond a specific vendetta against a new criminal organization called the Exchange, but the writer discussed his take on Frank Castle in an interview with Comic Book Resources. "There's a documented syndrome among snipers. You're sitting behind the scope, and then the word comes to fire and you reach out and touch somebody a thousand meters away. You don't know them and you never will and you ended their life. You get a sense of power and almost godhood from that," Rucka said. "There are documented cases of snipers who continue to just shoot even after they've taken down their target. In many ways that could be Frank, but it isn't. Why isn't it? Because a lesser person would have gone mad a long time ago and I refuse to accept that the Punisher is crazy. 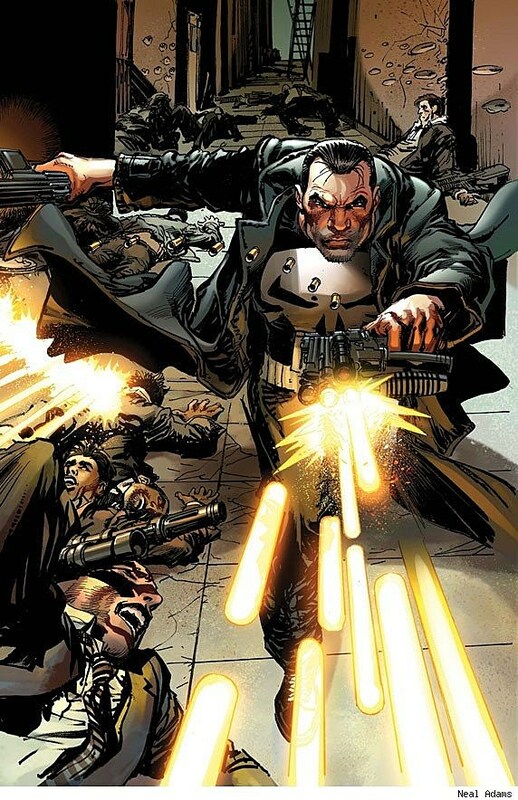 There's no point writing the Punisher if he's crazy because then you take away his ownership of everything he does." The Punisher #1 goes on sale in August. Marvel is pleased to present your first look at The Punisher #1! 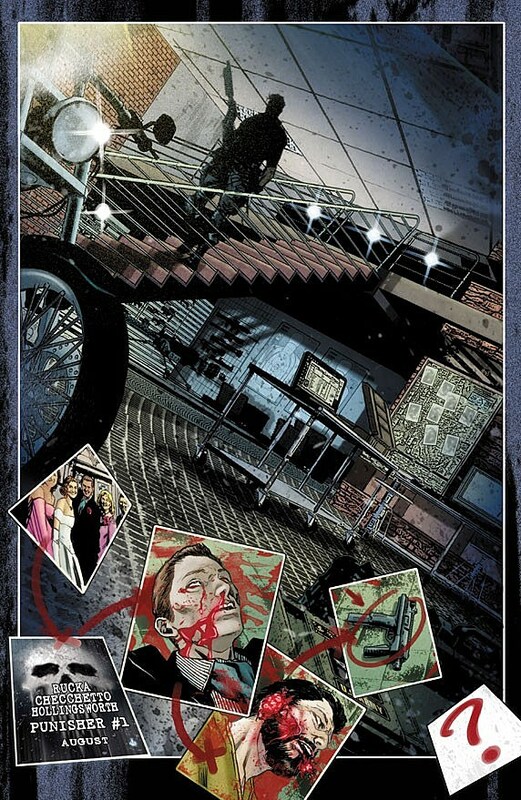 Eisner Award winning writer Greg Rucka and rising-star artist Marco Checchetto set the Marvel Universe's deadliest man back out onto the streets! 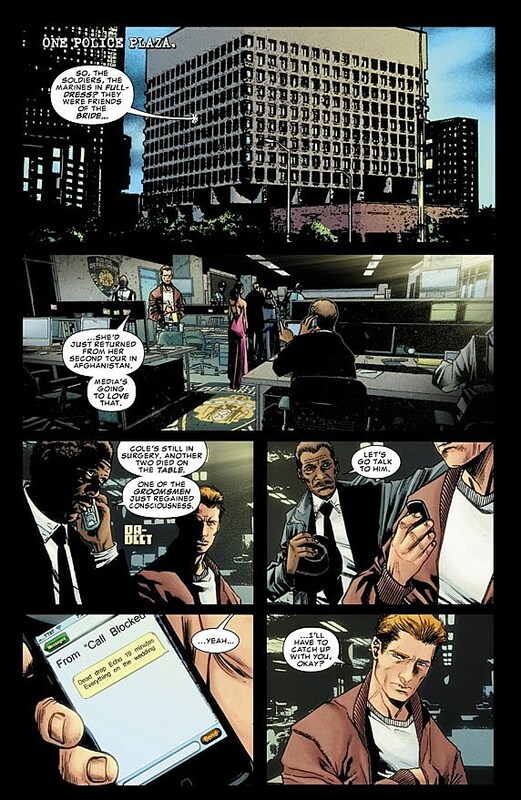 Frank Castle is locked and loaded for his most violent mission yet as he takes aim on New York City's newest criminal organization, The Exchange! Can Marvel's one man war machine mow down the entirety of the Exchange or will they prove to be too much for Frank Castle to take on alone? 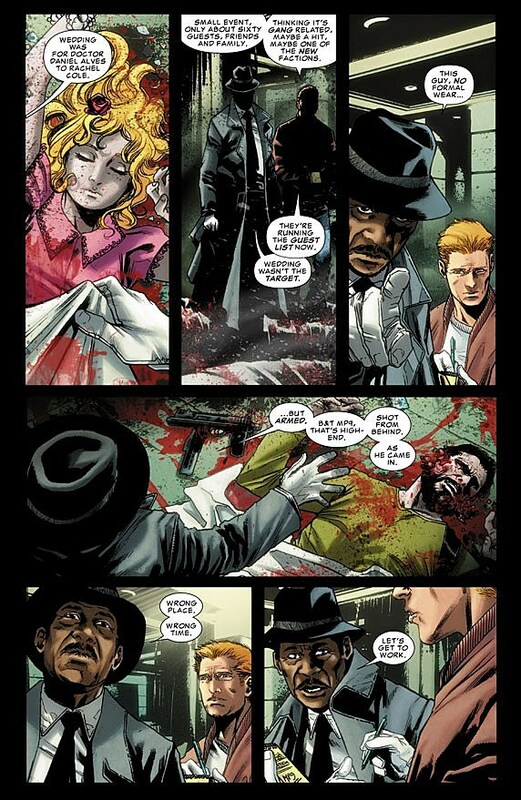 With every clip the Punisher empties into the guilty he gets further away from being able to find the man he used to be...and he has absolutely no problem with that. Get a view from behind the crosshairs as Marvel's newest Big Shot unleashes his brand of justice, only in The Punisher #1!